- The camera is totally self-contained with built-in rechargeable lithium-ion battery. Simply record video of who ever might be in front of you. The camera is totally self-contained with built-in rechargeable lithium-ion battery. 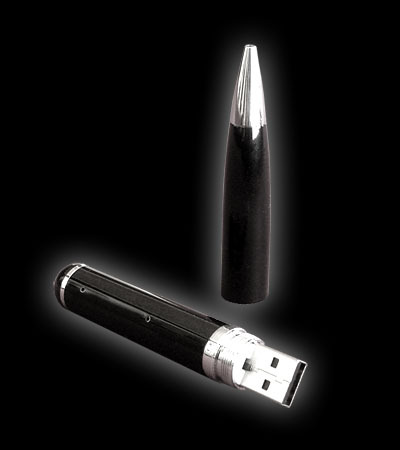 We carry the newest generation portable pen DVR cameras. Others might carry the same looking cameras but it might be the older generation camera. Only way to verify the version is to compare its sample video. Please Note: We no longer include plug-in charger for our pen camera. The charger is made by a different manufacturer and there were some quality problems that cause the pen camera to malfunction. Best way to charge is by USB port on your PC. Are you interested in this Pen Camera / Body Worn Camera but not sure what's required for setup, how it works or you just have a general inquiry? Chat with one of our Body Worn Camera Specialists. "Great product, works as described. Also, fast shipping and great service by spycamera.com, I would buy from them again with confidence. " "worked fine. just crapped though. will be getting another however"
"Purchasing the product was painless. I received receipt of purchase and shipping confirmation the same day I placed my order. I ordered the classic spy pen. It arrived exactly as advertised with instructions for use. The product itself feels very solid and the build quality overall is fantastic. I am very pleased with the purchase and definitely have plans for another purchase in the near future." "I am very satisfied with the purchase I made of the DVRP-4G Camcorder Pen. The pen was as described on the website and has performed as advertised. I had a question early on about the operation and received a prompt response to my question. Being able to order with a printed order form and money order rather than just online is an additional attraction. Would purchase from SCS again." "The Spy Pen records fine but the blinking light was noticable by a few of my students which distracted them during small group instruction. So during another time I was recording, I used a piece of tape which worked out ok. The most inconvenient part is to turn on and activate recoring without being noticed by others. I am still working on being more stealth in using the Spy Cam Pen"
"I purchased DVRP-4G 2.0 MP, (25f/s), Spy Camcorder Pen in October for my son. He was very happy with it. The video quality was good and he was able to use it on his Mac easily. Given the size of the camera, it is really fun to see the video it produces. About two weeks in, the "on/off" button broke. SCS promptly issued a RMA (very polite and helpful on the phone) and we now have a replacement unit. My son thinks it is better than before and is happy. He rates this a 4.5 out of 5. SCS stood behind their product and I would also give them high marks." 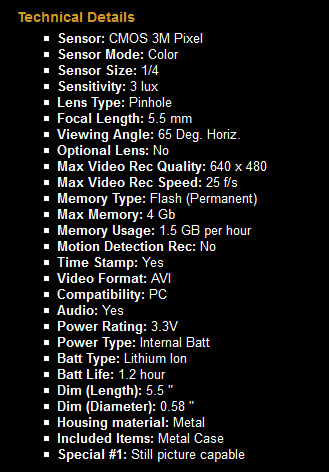 "I was looking for a camera pen on line and found a bunch of different ones with varying levels of quality. Given that prices also varied a lot I was hesitant to make a purchase, worried that I might be paying a higher price for a defective product. The website addressed this very issue on their page and explained why there was such a quality/price difference across the web. They also seem to have decent quality control because they don't sell the pens with a wall charger, which from reviews across the web were made by a third party and malfunctioned often. I got my pen in the mail 2(business)days after I ordered it, and it is exactly what I was hoping it would be. It works perfectly, and apparently was tested before it was sent out (as there was a short video of a desktop on the camera). 5 stars. If I ever want this sort of stuff in the future, this is where I plan on buying it." "got spy camera pen from SCS. Very impressed with the audio/video quality. Had a litle trouble getting video to work, but SCS helped me get it fixed with their support line. Would recommend both SCS and the spy pen." "the delivery was on time,but the camera has bad resolution for things there are far from it. SCS Reply: This camera is not made to see things far away. In fact, there is no camera that will be wide angle and same time pick-up details that are far; it's optically impossible. 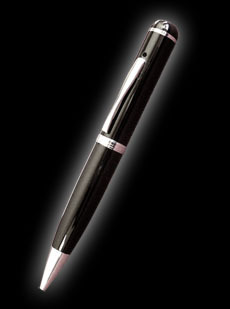 Also, all our pen cameras and alike are provided with sample video on our site so there will be no misunderstanding." "Excellent experience. Product was as expected (very good) and shipped very quickly. Would definitely buy from them again." "I'm very happy with my purchase, I've always a spy pen camera but wasn't sure which to get until now. I've just used it for 4 days and I love it so far." Q&A: Have a specific question about this Pen Camera? click here. 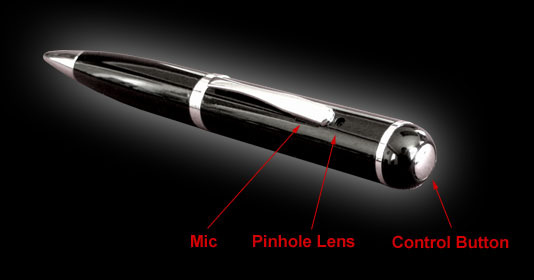 Where is the lens located on a pen camera? Pinhole lens is located right over the clip and it will face forward as you wear the pen on your front shirt pocket. Would the flashing recording light indicator be seen by others? When you wear the pen camera on your shirt, the recessed blinking light will face towards you so others can not see it. In low light, the light might reflect off your shirt so cover it with a small piece of, for example, electrical tape.